With the spring came to Prague also big water. 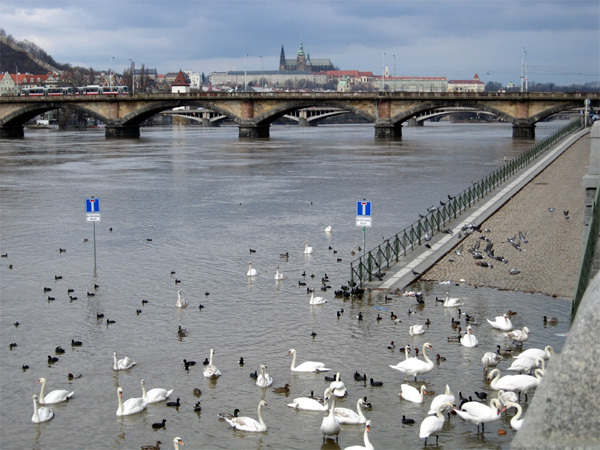 The level of water come up every day and Vltava river changed to small ocean. Swans and ducks admire it. Traffic signs under water show where is ordinarily place for loveliest walks around Vltava river. Now this place belongs to fishes. This picture was taken from Vltava river bank, near Palacky Square (Palackého náměstí) an Palacky Bridge. On the horizon is Prague Castle with St. Vitus Cathedral. Posted: Praha, Mar 30, 07:01 by Czech-man. Your pictures are wonderful and I am hoping that the flooding will not go any higher. the statue on your picture is called “Commendatore” or “Pieta” by Anna Chromy. You can find it in front of the entrance of “Stavovske Divadlo”, only 50 meters from the Old town square. It serves as a reminder that the “Don Giovanni” of Mozart had its grand opening in this beautiful opera on october 29th 1787. © 2005, 2006, 2007, 2008 Prague pictures | all prague photos | RSS / Atom.